We offer a 7 day free mining trial to help you evaluate our mining services. No credit card or payment info is needed. During the trial we will dedicate real hardware and electricity to mine for you - exactly the same as we do for our paid accounts. During the trial, your account will be in "trial mode" and you will not be able to withdraw your earnings. Anytime within 14 days of starting your trial, you may upgrade your account by making a purchase. If you choose to upgrade during this timeframe, the earnings from your trial period will be credited to your account in proportion to your purchase - i.e. if you purchase half the amount of your trial, you will receive half of the trial earnings. If you upgrade AFTER 14 days, it will be treated as a regular purchase and the trial earnings will not be credited. All you have to do to get started is use one of the links below to sign up on our website OR download and signup on our mobile app for iOS or Android. When you sign up make sure to use your real name, a real phone number, and a real email address – these items will be verified before you are able to start the free trial. Once you've finished creating your account and verified your info, navigate to the "Mining" tab of the app or website. Click the button labeled "START FREE TRIAL". 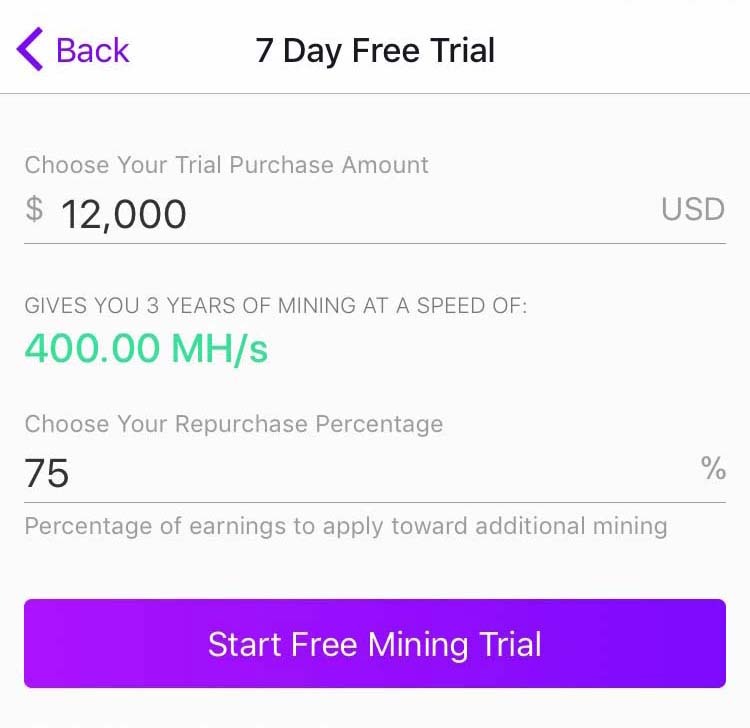 In the field labeled "Choose your trial purchase amount", choose the total amount you are interested in spending on your future mining purchase. You should choose an amount close to what you are actually considering spending - that way you will see realistic mining results to help you make an informed decision on your future purchase. Note: You are not locked into purchasing this amount. When you choose to upgrade later, you will be able to choose a different purchase amount. Once you enter a trial purchase amount, the corresponding mining speed (MH/s) this amount would purchase will be displayed in green text. Our perpetual mining feature allows you to apply a fixed percentage of your earnings towards automatically repurchasing additional processing power. This enables you to continually increase your mining speed. We recommend choosing a repurchase % for the trial so you can experience how it works. For example, if you want all your earnings to be put toward additional mining, enter "100%". If you want no repurchasing to happen, enter 0%. If you want half of your earnings to purchase more mining, enter 50%. Each repurchase of additional mining will have a full 3 year mining term from the time it begins. *The Repurchase Percentage can be changed when upgrading to a paid account. After your trial purchase amount and repurchase percentage are selected, click "START FREE MINING TRIAL" to instantly start mining. You will be taken to your new mining Dashboard where you can view your real-time earnings, current rate of earnings, as well as other mining details. Make sure to login and check on your mining progress daily. If you like what you see, it's time to upgrade to a paid account. Click "UPGRADE NOW" and follow the instructions on the screen. If you upgrade within 14 days of starting your trial, the free earnings from your trial period will be credited to your account in proportion to your new purchase - i.e. if you purchase half the amount of your trial, you will receive half of the trial earnings. If you purchase double the amount of your trial, you will receive double the trial earnings. If you upgrade AFTER 14 days, it will be treated as a regular purchase and the trial earnings will not be credited. From this point on we take care of all the hard work of managing and maintaining the hardware, and guaranteeing 100% uptime for your mining plan. You can check your mining performance as often as you like by opening the app or website and viewing your mining Dashboard. Mining payouts will automatically be sent to the cryptocurrency wallet address you provide us when upgrading. Need more info before you get started?